Ideal for open terrain and mountainous or hilly country. Equipped with a ranging reticle, this warrior saw heavy use in the middle east. M1050r 10x50 is rated 4.7 out of 5 by 7. Rated 5 out of 5 by Jack from A totally different way of looking at things. These binocs use a totally different approach to focusing than you are probably used to. You focus it once on a target in the near distnace, then they are in focus for a tremendous depth of field. No more refocusing everytime you look at something diffent. It took me a few minutes to get used to it, but now what a difference it makes when scanning for targets. The image is very bright and clear. Much better than my Oh-My-God expensive spotting scope. Bomb proof construction and waterproof as well. A great value for the price. Rated 5 out of 5 by Cody from Great low light optic One of the best pairs of optics I own and use and have used. I use lease on both my deployments to Iraq and Afghanistan. During my depliynents we also had other namebrand manufactures. But the ability of a Steiner to bring in as much light as possible far surpassed the others we had in our units. They were my go to optics. I had caught several Enemy combatants or IED implacers. Using them was a Great force multiplier. I now use a pair although they belong to my father I had convinced him to buy them because I had great luck with them during my deployments. You will not be dissatisfied with this purchase if you decide to go this route. They are great unbelievably strong and will take more abuse in anything that you probably currently own but that is just my opinion. 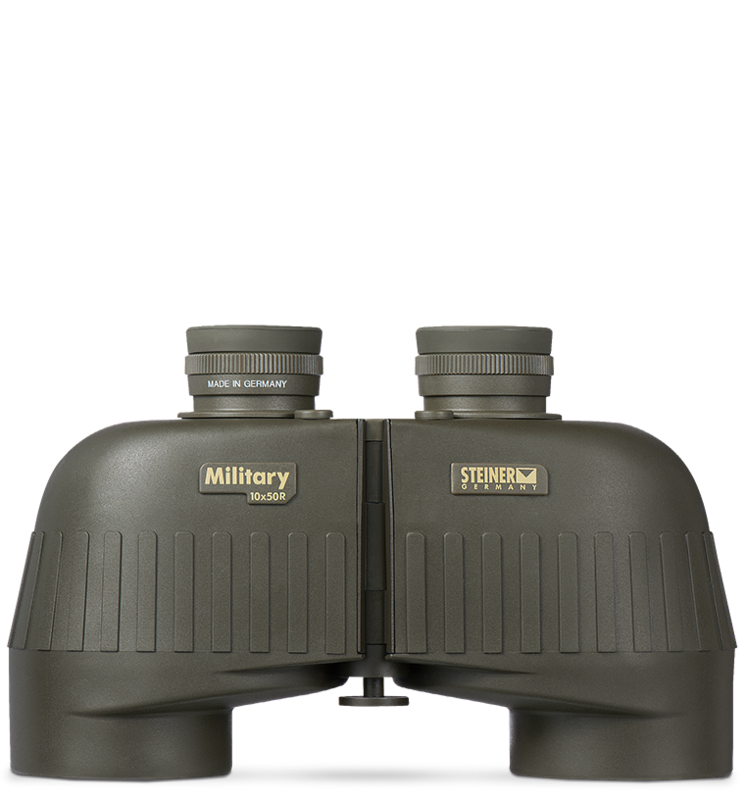 Rated 5 out of 5 by socalCJ from Rugged and dependable Outstanding set of binos! Yes, they are a bit heavier than the lighter (and costlier) roof prism binos, but these things can take the abuse. I have dropped mine several times onto some pretty hard terrain. Did not hurt them one bit. They remain focused. I am amazed at the high quality Steiner maintains. My first expericence with these was back in the 1980s'. I was in the Army, and we were issued the excellent M22 7x50. One day, a driver reversed over my gear with a Humvee. The steiners were in my pack. My toothpaste, foot powder, and shaving cream were all squashed flat. The Steiners were fine, and showed no damage! wiped the toothpaste and foot powder off, and they were unaffected. I have the 10x50 for work now, and they see duty in marine and desert environments. I've owned this set for 8 years, and I am absolutely happy. I cant enough good about my Steiners. Rated 5 out of 5 by The Navigator from Awesome Binoculars Purchased in June 2015, and immediately took to Teton National Park and Yellowstone on vacation. Had prior experience with Steiner from the Military, and wanted a rugged & dependable binocular for outdoor, adventure and hard use. The 10x50 performed flawlessly in all conditions - especially harsh weather, low light. Also have Steiner 7x50s, but wanted the increased magnification for better clarity while wildlife viewing. Cant wait to use during hunting season ! Rated 5 out of 5 by Tony from Outstanding product for the price. I have used these binos before. There a bit heavy for long hunts, but are perfect for that shorter hunt, or nature hike. The quality of these surpass any draw back of their weight. I am extremely pleased. Rated 5 out of 5 by Reggie from View is crystal clear, always focused. I have 5 Steiner products and would never consider any other brand. I work in-law enforcement and have used my optics instead of issued ones. I would recommend Steiner above all others. Rated 3 out of 5 by MIKEY46 from too expensive MY NIKON IS BETTER I BELIEVE. WHY STRAPS FOR STEINER CASE WERE NOT ATTACHED IS ANOTHER ISSUE.ALL MY OTHER BINOCULARS HAD STRAPS ON THEM.OWNERS MANUAL (3.5x4.5) inches was not a plus either. Are the M1050R model binoculars avaiable with the integral compass and if so what is that added cost. Can you adjust the orientation of the ranging reticle? When I have the adjusted for my eyes&lt;60 the reticle is tilted and I have to adjust by tilting my head to make the reticle upright. The reticle orientation is based off the width of the binocular center hinge. If the binocular is narrow the reticle will appear canted. my left lens is foggy. Do i need to open it up and clean it or i need to purge it with n2, and if that so what type of jointer do i need to connect the binocular to the purge pump , because i have a nitrogen purge pump for only night vision goggles. There is this model in black color? Currently a Military grade binocular are not available in Black. I would recommend taking a look at the Police model. What is the minimum to maximum range of diopter adjustment on the M50r models, and how much &quot;play&quot; is typical at either end of the adjustment range? -5 to plus 5. There is quite a bit of extra adjustment at the end. Unfortunately winged eyecups are not available for this model.